SSC Selection Post Recruitment 2018: The Staff Selection Commission (SSC) has released the official SSC Selection Post Recruitment Notification 2018 to fill up more than 1000 vacancies across 130 posts. Online registration for the exam has already started and the last date to apply is 30th September 2018. This is a great opportunity for those who want to work in the government job sector. As there are so many vacancies for so many posts, aspiring candidates must read the SSC Selection Posts Notification carefully and get a proper idea about the requirements for each of the post. They must be thorough with the SSC Selections Post eligibility criteria, application form, exam pattern and other important information about the recruitment drive. 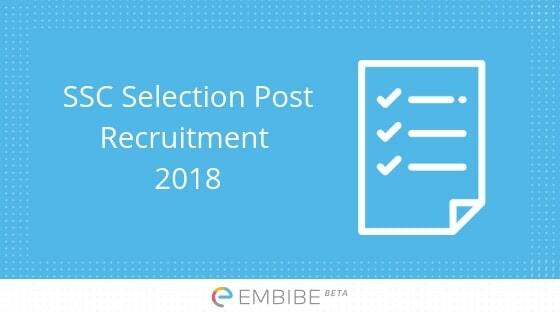 In this article, all the necessary information regarding SSC Selection Post Recruitment 2018 will be provided. Read on to find out. Before applying for the exam, aspirants must check the SSC Selection Post eligibility criteria for the post they are applying for. 5. A person of Indian origin who has migrated from Pakistan, Burma, Sri Lanka, East African Countries of Kenya, Uganda, the United Republic of Tanzania (Formerly Tanganyika and Zanzibar), Zambia, Malawi, Zaire, Ethiopia and Vietnam with the intention of permanently settling in India . Age The minimum age of the candidate should be 18 years. The upper age limit for unreserved categories is 30 years. Educational Qualification Depending upon the post, candidates must have passed Class 10 board exams, Class 12 board exams, or degree course (graduation) from a recognized board / University. SSC Selection Post application form is available online on the SSC official website. You can apply for the exam only in the online mode. Step 2 Click on “Register” under “New Registration” on the left side of the screen. Step 3 Enter your basic details – Name, Parents’ Name, Email ID, Gender, Date of Birth, etc. Step 4 A Registration Number and Password will be generated for you. Note them down. Step 5 Upload scanned copies of your Photograph and Signature in JPEG format. Size of the Photograph should be between 4 to 20 kb. The size of the Signature should be between 1 to 12 kb. Step 6 Submit your registration form. Step 7 After completion of registration, you should fill up the remaining online application form. Step 8 Generate the SBI Challan (wherever applicable) to pay the SSC Selection Post application form fee. Step 9 Take print out of the SSC Selection Post application form for future reference. It is to be noted that candidates who want to appear for multiple posts have to fill up separate application form for each of the posts. However, multiple application forms by any candidate for any one post will lead to cancellation of the application. The application fee cab be paid in the offline mode only, through SBI Challan generated at the time of registration. The Computer Based Test will have objective, Multiple Choice Questions (MCQ). The total time duration is 60 minutes and there is negative marking of 0.50 marks for every wrong answer. The SSC Selection Post admit card will be generated 7 days before the exam. It is an important document that must be kept safely until the end of the recruitment process. It should be carried by the candidate to the exam hall, failing which they will not be allowed to appear for the exam. In order to download the SSC Selection Post admit card, candidates will have to login to their account on SSC official website using their Registration Number and Password / Date of Birth (DOB). SSC will release the tentative SSC Selection Post answer key after the CBT is conducted. Candidates can check the answer key and challenge if they are not satisfied with the answer of any question by paying a fee of Rs 100 per question. This facility will be open for a certain time period after which no challenge will be accepted. After that the final answer key will be published. The SSC Selection Post result will be published on the official website of SSC. Candidates will have to login using the same login credentials (as generated during registration) to view their result. Now that you know everything about SSC Selection Post Recruitment, start your preparation. Go through the detailed SSC Selection Post syllabus and master each and every topic. Take SSC Selection Post mock tests as well. As the syllabus and pattern of SSC Selection Post exam is almost same as that of other exams for government jobs, including bank PO jobs, taking bank PO exams will help you a lot. You can take bank PO mock tests for free on Embibe. With Embibe’s Advanced Test Analysis, you will also get detailed insights into the way you took the test and the mistakes you made. Creating your improvement plan will become easier after that. We hope this detailed article on SSC Selection Post Recruitment 2018 helps you. If you have any confusion, drop a comment below. We will get back to you.